The first (and really only) thing the SDL Tridion Community MVP Selection Committee does at the start of the year is vote on MVPs and Community Builders (internal MVPs). In the spirit of sharing, let me post thoughts on the selection process, a winning formula (there is none), a practical approach at selecting, and making this easier for me, which will ultimately help you. First of all, I don't choose candidates except for the few I nominate myself. Suggesting candidates is the community's (your) job. I ended up on the committee as a case of Midas Rule--a colleague changed job roles (it's old news but congratulate him if you haven't already), which left us with a spot open in SDL Professional Services (PS) to vote on community contributions. I've been both an MVP and a Community Builder and tend to both share about Tridion, but also promote and comment on the community itself. So having me vote on the community was a good fit at the time. The committee has 2 from SDL and 3 externals. Committee members cannot vote for themselves, so being on the committee means I need to earn 3 out of 4 votes instead of 3 out of 5. So if we posted "to be an MVP you need 12 blog posts" then we'll likely see several community members with (just) 12 blog posts. That's a poor way to encourage thought leadership. Imagine what would happen if we based selection on the number of open source code check-ins or bug fixes. It won't guarantee you a win but to get my vote, share or contribute to the SDL Tridion community regularly, over the course of the year. I tend to share a bit more than, well anyone else in the community. But I expect something comparable from community award candidates. Give or take, I feel Community MVPs should contribute something each week, month, and/or quarter. What you share is up to you, but don't let the Curse of Expertise hold you back. You probably know more than you realize (you're doing Tridion for goodness' sake). Stick to the plan, but don't give up if you start late or have a bad week, month, or quarter. Have fun and appreciate, but simultaneously ignore, the incentive(s). These recommendations mimic advice for healthy lifestyles other personal improvement plans--actively participating in any community is more of a lifestyle choice and you'll do best if/when it becomes part of your identity ("I'm on a diet" versus "I'm a healthy person"). To stretch the metaphor, avoid binging. :-) Pace yourself and don't go to extremes. 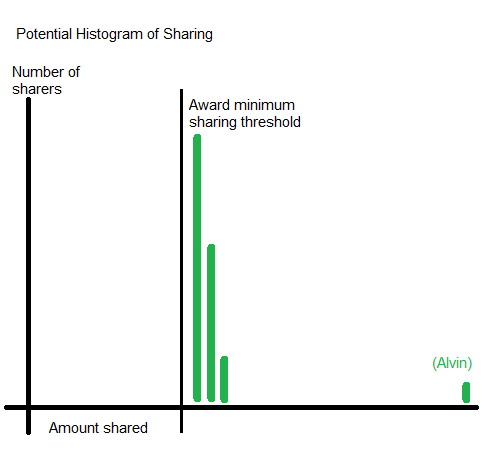 I've seen sharing just for the community award backfire, where the second hardest part is starting. The hardest part will be sharing in year two, which is a lot like the day after University final exams where you promise to turn in that late assignment or submit extra credit (and it doesn't happen). Will I contribute over the course of the year? If you are going for the community award or are mentoring someone who's interested, make it easy for me. Be visible. Use or note your real name in your posts, blogs, and other contributions (for a counter example see ju.Xk5 e8O G6R Hs,[L-). Make a personal, "professional" site. Have a personal site, corporate blog, and/or Linked-In profile, even if you don't post much. Reference your other accounts and contributions, highlight interesting things, and let me know what you've worked on. Organize your contributions. Label or show your posts in a top or side navigation on your blog. I want to be able to peruse and see what you have. 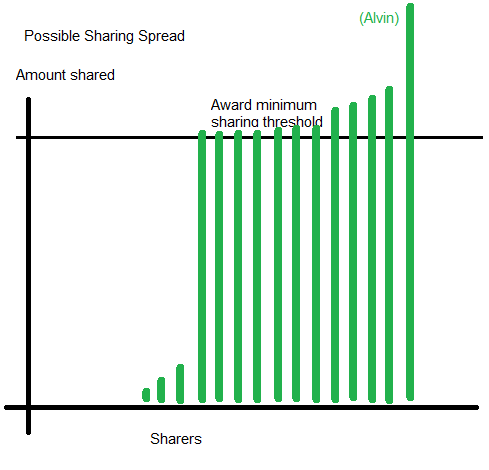 Share your shares. Tweet and share your posts as you post them. Automate this where you can. Add context. I don't follow all the ("for Tridion") frameworks. Summarize what you've shared, highlight fixes, gotchas, or other things you've worked on. Use Tridion Stack Exchange Meta to share community news and updates. Be "findable." Apply SEO to all of the above. When someone Googles your name + Tridion, it should surface what you've worked on. Connect. Tell colleagues what you're working on, reference your contributions and those of others. If you notice, these aren't just selfish requests from someone that has to evaluate your contributions. Making yourself visible, having a site that reflects your professional personal brand, organizing your contributions and then promoting them all while being Google-able will help you professionally. Your content can have an impact only when others can find it! In the end, the best part of contributing to a community is connecting with others--getting a chance to share a beer, story, and/or song with global colleagues is simply awesome. You don't need an award for that. So you have me and I get to vote on you. There is no formula and if there was one, it'd make things worse. There's simply a question: "did you share?" Edit: the ratio of SDL to external committee members has always been 2-to-3. Historically it was 2 from SDL PS, but roles and volunteer interest change so it's 2 from SDL as of 2015. I think it's great that you highlight the fact that there isn't a tried and true "formula" for sharing, and I'm glad it's that way. The MVP Award program should be a reward for your commitment to improving the community, not a December 31st finish line. I think the big idea here is that you're trying to reward an intrinsic motivation, rather than create an extrinsic one. That's hard to do because it effectively means that you have to balance a subjective and an objective ranking. I debated heavily on whether I wanted to accept the 2014 SDL Tridion MVP award - because I didn't want it to change my motivations for writing and sharing. A question that I ask myself frequently is, "am I writing this because it needs to be written, or because I want something out of it?" If it's the latter, rather than the former, I delete the post. "...why some people criticize awards, like our MVP program - the fact that the person getting the award is only in it for himself. If that's the case, then I love it." --"KnewKnow"
Definitely, on the whole, write because you love it. But there is an art in writing for influence, impart, and even rewards. Being transparent, honest, and authentic makes the difference.